With Show Being Apple Inc.'s Last Appearance, Will 2009 be Surprise to Top them All? NEWS: (1.6.09)-- "The first 30 years were just the beginning..." and "There's something in the air" were Apple's taglines for 2007 and 2008 respectively. What Apple's slogan is for this, their final curtain call at Macworld Expo, remains to be seen. There are definitely a lot of questions on everyone's minds as to what will be announced, released, and said. Whatever does transpire today, we've got it all covered. Please stand by as we wait for Apple's Senior Vice President of Worldwide Marketing, Phil Schiller, to give the final keynote address this morning, scheduled for 9:00a PST. iMovie to follow suite, er, suit? 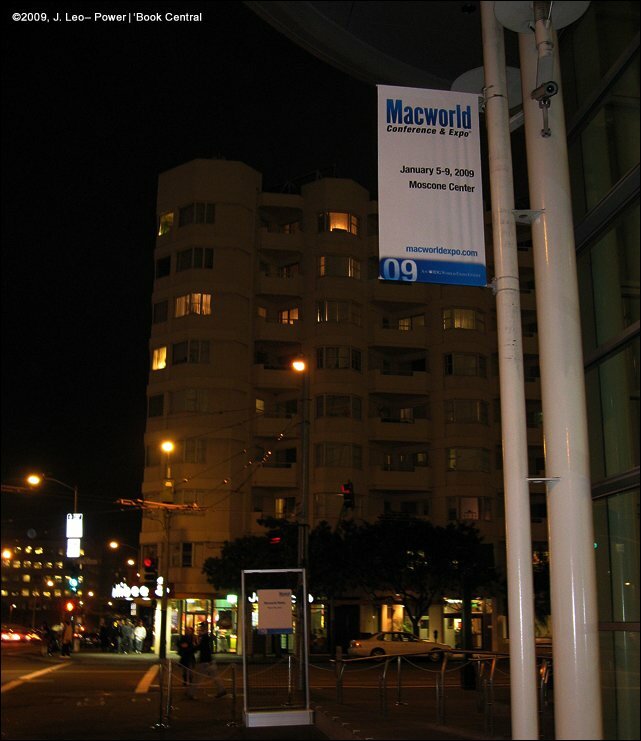 Stand by as we prepare to bring you LIVE coverage from Macworld in San Francisco. Click on the following LINK to take you to the active page. ** (If you don't see anything, the Keynote hasn't started yet, or something's happened to the columnist covering the event! Don't worry though... this year, the folks at IDG are giving us a "reserved" seat!). Note: during LIVE coverage, you will notice the page you clicked on automatically refresh itself every 90 seconds (1.5 minutes) bringing you updates as you read, with the latest news and announcements on top. **At the end of the keynote, the previously active link will change URLs to a formatted and cleaned up page, either later this afternoon and/or early evening. 'YOU ARE (NOT) HERE': That's the sign for the special "Macworld Media" line for members of the press and, of course, media that's right up front at the entrance to Moscone Center West. (This columnist's third venture into Macworld finally gets him a backstage pass of sorts, but sadly, no Steve Jobs, and Apple's last at the Expo. Still beats waiting in a long line with the regular folks and the risk of not getting in!). Will there be a need for special lines, much less, any lines come Macworld 2010?